Steel Blue is now Australia’s largest supplier of safety footwear. And following a series of technological innovations and original marketing initiatives, they have quickly grown to become Australia’s leading supplier of premium industrial safety footwear. 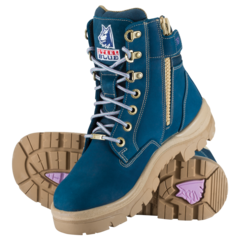 So confident is our team of the premium-quality of the Steel Blue product, we offer a 30 day money back comfort guarantee on every boot we sell. No arguments; just a rock solid promise to stand 100% behind our product. It’s this kind of honest and fair-minded approach that we like to see applied to every part of the business. 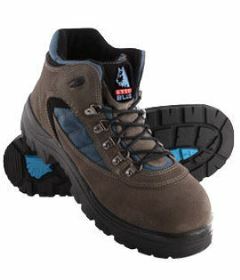 Steel Blue work boots absorb more shock, helping to reduce stress-related injury and day-to-day fatigue. 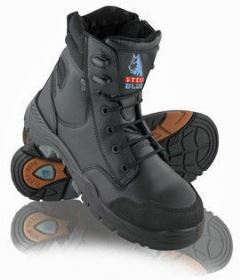 By reducing stress on the ankles, knees, hips and spine, Steel Blue boots promote better health and wellbeing. It’s the patented multi-density sole that’s the secret. This technology, called Trisole Comfort Technology (TCT), creates a cushion-like effect. By wearing Steel Blue boots, workers’ exert less energy with every step, increasing performance and minimising the risk of injury. That’s why Steel Blue boots are the only work boots in Australia endorsed by the Australian Physiotherapy Association (APA) and the Australasian Podiatry Council (APODC).